There are many topics swirling around Cincinnati sports, and the best way to sort them out? Questions. The best way to sort out the questions? Answers. Yes, we've reached the point where it's questions and answers time. Unless you want to read a 43,000 word post about Mick Cronin's comments on why Yancy Gates didn't play at the end of the game Sunday. Why didn't Yancy Gates play at the end of the game on Sunday? If you listen to Mick, it's because he says that Marquette was exposing Gates and, to a lesser extent, Steve Toyloy. If you listen to Marquette head coach Buzz Williams, that was not the case. If you read Marquette blogs, like Cracked Sidewalks, they were happy that #34 took a seat on the pine. If you read any UC blog or message board, they are furious about this. As we should be. Every coach worth their salary goes offense for defense in those situations. It's no different than if Yancy was playing with 4 fouls. Yet, Mick was happy running pretty much a man down on offense. Ibrahima Thomas is good and getting better, but he only had 5 points at the end of regulation. He wasn't playing that well. Dion Dixon and Cashmere Wright went offense for defense down the stretch. It's baffling to me. Is Deonta Vaughn the alpha dog of this team? I'm going to surprise everyone, no. I don't think this team has an alpha dog. I think it could have been Lance Stephenson, but he lost whatever mojo he had after the first Connecticut game. Maybe he let the game winning points and praise get to his head. He's been pretty not good lately. I would like to see him get more minutes, but he's not doing much with the minutes he's had ever since he came back from injury. Besides the Notre Dame game, he played well then. Yancy Gates could be the alpha dog, but it doesn't seem like he wants to be. When he wants the ball and plays hard, he's nearly unstoppable. But, his play comes off as nonchalant at times. I'm not saying he's not trying, but it looks like he doesn't care much if he gets touches or runs back on d. Having said all that, it SHOULD be Deonta Vaughn's team, and the fact it's not has really hurt the Bearcats. We have needed a leader to step up since the let's say UAB game, but none has. I don't know what happened to Deonta. The past 3 years of Vaughn put this version to shame. I don't know if he wanted to get drafted so he started playing more point guard and distributing, or whether he and Lance Stephenson hate each other and can't play together. Deonta had his big alpha dog moment of the season Sunday, and I guarantee sophomore Deonta nails that 3. What undersung player does UC need to be more consistent every game? Rashad Bishop. In a way, Bishop signifies this team. He'll play great, not show up, play solid, play bad, and play ok. He played really well on Sunday against Marquette, he no showed Louisville, played solid against Providence, played badly against South Florida, and ok against UConn in Hartford. Rashad is the most improved Bearcat this season. In the games he hasn't shot well, he's rebounded well. I would like to see his assists take the uptick they did last year though. He seems more confident in his shot. He needs to work on the 3 ball still, and getting the 2% back up to the 60s where it was last year. Are the guards coming off the bench finally back to playing like we know they can? I really hope that Larry Davis, and Dion Dixon, who is my best friend, have started going out there and just played. Both played pretty significant minutes until Big East play started. Larry even started a few games. Both get their minutes yanked around, but I think Davis is rounding into form. After a horrible shooting slump, he's hit 8-17 from 3 the past 3 games he's played minutes in. Dixon has rebounded well in his time, but he needs to work on his jumper this summer. He shot 25% from 3 last year, and is at only 30% this year. He shot really well against Marquette, but I think that taking too many 3s is what gets him bench time. He can play d and be a pest, so we need him playing hard and well. I think that both are ready to step in again. Especially if Lance Stephenson has checked out. 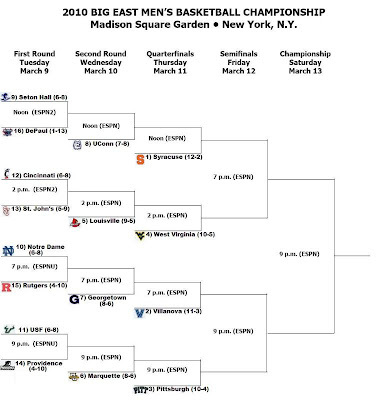 What does the Big East tournament bracket look like right now? Per our friends at Friar Blog. Can we stop talking about basketball now? Are any UC athletes on the twitter? There are a few. On the Bearcats Blog twitter account, I have a list where you can see them all. It's quite fancy. 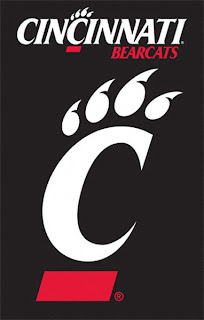 My twitter is @ucbearcatsblog. Any truth on Cincinnati playing at Tennessee in 2011? Yes, that's absolutely true. It's just a one time deal with UC playing in Knoxville, but it's a good thing. I just found this out like 3 days ago, so I'm hoping you were all in the same boat as me. April 24. I've been promised that this is a different team than previously. I'm interested to see how the running back situation plays out. I really like Isaiah Pead, and I think Darrin Williams can be a stud. He's pretty fast, and I think he could be a gamebreaker. Where do draft analysts think Mardy Gilyard is going in the draft? From everything I've seen, Mardy is being projected as a second round pick. People are worried about his weight, 185. Mardy has all the skills and drive, and I think if he has a good combine, starts Saturday, he could be a late first rounder. Maybe that's overly optimistic, but I believe in Mardy Gilyard. Tony has been ranked as the 4th or 5th best QB in the draft. He has also been told to bulk up by the analysts. Whatever the dude's name on the NFL Network said he has Pike in the 4th round. Mike Mayock's his name. He is normally pretty right, and he's not Todd McShay, so you can believe him. Who is the coolest Bearcat football player? That's a tough one. On one hand, I lean towards Travis Kelce because he once retweeted me. On the other, Reuben Johnson's nickname is Daddy. Plus, Reuben Johnson follows me on twitter, and that makes him the coolest Bearcat of this time, and currently, of all time.